I think that everyone would agree that this year’s event went up a notch on the enjoyable scale! The Friday night meet in the Black Bull at Midgley was well attended and re established a lot of friendships developed the previous year. We reserved the old section of the pub so that we could all be in the same area, not that anyone else hung around for long last year after we all got started. The pub part of the meet gives us chance to catch up before the main event in the Sculpture Park. The afternoon session was led by Kelly Amos of the Sculpture Park staff and as an old Brettonian, she has had a keen interest in helping to develop the Alumni. Firstly, we had a visit to the newly refurbished Kennel Block and had a look around to view the changes. Sadly, the smell of stale beer ingrained into the flooring had disappeared, and in its place was the smell of new woodwork and plaster. Having said all of that, the building has been developed very tastefully, with a very nice café underneath the old performance area. Something that we all remarked upon was the impression that the building had grown longer. All that we can think of is that part of the upstairs at least must have been used as a store, or blocked off in some way? Anyway, I think that we were all impressed and quizzing Kelly about how we could get back in there and have concert of some description. It has to be used for educational purposes, so we are about to scratch our heads and find a way to fulfil the restriction. The final part of the visit was to view the work being carried out around upper lake. Much of the scrub and insensitive planting of the Leeds University era has been removed, to expose the landscape that was intended in the original plans for the house. The landscape sculpture is almost back to that design and the result is quite amazing. We can see the lake and the mature trees from Mansion again, as it was up until the late 1970’s I have put a panoramic view taken from the bridge, looking back to Mansion on the front page of the website. The work on upper lake has been substantially sponsored by Dr. Alyn Davies, a much respected past Principal of Bretton, and we feel as Alumni that we should help find the rest of the money for this project, having been very impressed with the work so far. Several features of the upper lake have been restored, including the Boat House, Greek temple / viewing point, monument to the original house and Shell House. All the lakes bridges are being made safe and renovated, as well as pathways cleared and surfaced. I hope that we can make a bit more of a presentation about this work as things progress. With a view to getting the Alumni to help raise money for the restoration, Kelly is going to put together a plan from our ideas. 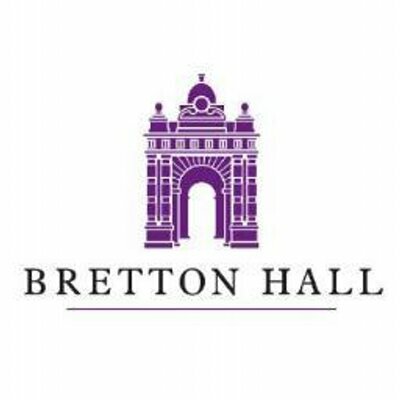 Finally, I would like to thank Dr Davies for his initiative and lasting commitment to Bretton, and hope that this gesture will inspire us, as Alumni, to contribute also. The main event was the evening meal and impromptu performances by our Alumni group. The meal as always was excellent but the contribution by the other members was really memorable. Marcia Philips (nee Corefield) was over from Canada and after a little encouragement, put a set of folk, pop and whistle music together, which mentally sent us all back to our student days. Last year we tried to formalise the music a bit and it didn’t really work, but this time it was deliberately ‘ad hock’ and it worked. Musical contributions were made by Marcia, Rick Jerome, Dave Holland, John Stones and even myself and Alan Beecham. This is probably the first of the reunions that I have attended where there was a genuine ‘Breton feel to the proceedings. A very good weekend, and I look forward to the next one on the 18/19th May 2012.